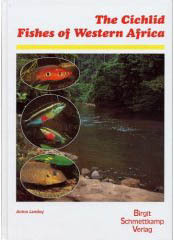 There are few books available about the cichlids of West Africa and this book is by far the best available. It includes descriptions of every species known when it was published. It provides information about identification, natural habitats and aquarium husbandry for most of the fish described. However, as may be expected, the amount of detail provided about individual species varies considerably. The main drawback for dwarf cichlid enthusiasts is that only a small amount of space is given to the dwarf species. Rather the bulk of the book covers the myriad of species that clearly do not fit the definition of dwarf. In fact, of the book's 255 pages only 50 deal with species that might be considered dwarf's ( I am being a little generous here by including genus such as Limbochromis, Parananochromis and Teleogramma). Personally my biggest disappointment is that all of the forms of Pelvicachromis taeniatus are lumped into a single heading. Lamboj does write specifically about many of the forms and has a number of photos of them I would have loved to see a section where each form has it's own identified section. Despite this minor quibble, this is the best and most comprehensive book on West Africans. Dr. Lamboj received performed his investigative work for both his Masters and Ph.D degrees on the systematics of West African Cichlids and he is one of the world's foremost experts on these fishes. The cichlids of West Africa are a fascinating group of fishes and many, both dwarf and large, are among the most beautiful tropical fish. In recent years West African cichlids have become more widely available. Captive breeding and new export opportunities both provide fish for the hobby. I strongly recommend this book if you have any interest in these fascinating fishes.